Understanding your church's history has never been as important as it is today. Your congregation's identity and sense of purpose is bound tightly to its past. 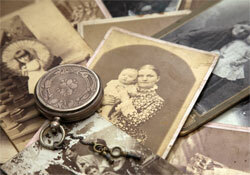 Preserving that past - making it available to study and understand - helps ensure a healthy future. Linking Your Church To History delivers the tools and knowledge you need to improve the preservation of your congregation's history. You will learn tools and techniques to preserve and share your congregation's history. To enter this course, click on its title above. In this course, we'll explore "knowledge is power" for 19th century Disciples of Christ women as they struggled for educational advancement. We'll look at the influences that drove building new educational institutions for women, compare women's curriculum to those of the male academies, explore the relationships and friendships that developed and examine the blossoming empowerment of Disciples women in their churches and the world. Participants will have hands-on opportunities to explore these topics through with instruction and guidance on scrapbooking, geneology, oral history, researching local history and social media.